Markers are great for quick sketching. 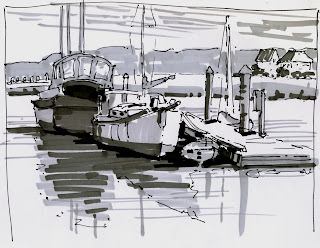 Simple to carry, not messy, dry instantly and you can get those values down on the paper. I use them frequently in advance of painting, especially outdoor painting, where values, wind, shadows, and tide are all changing. Making color notes also helps when the bugs drive you somewhere else to finish. Try them, hang with them, you'll like the results. This is the latest edition of my book on Value Sketching With Markers. Originally meant as a handout for my painting workshops, it has taken on a life of it's own, even getting a bit into printmaking. The first edition got very encouraging reviews from artists whose work I respect and admire. 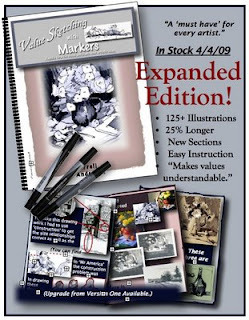 This book is about using valued art markers to simplify shape and values in your drawings. Painting and printmaking, using this approach as a foundation, both become much easier and more focused on what your work is trying to say. Later this week I'll post some more images from the book. Interested in the book? Contact me: studiolerada@me.com. It's nice to have it finished so I can get back to painting and drawing.